Converting certain file types into other file type requires lot of time and resources. 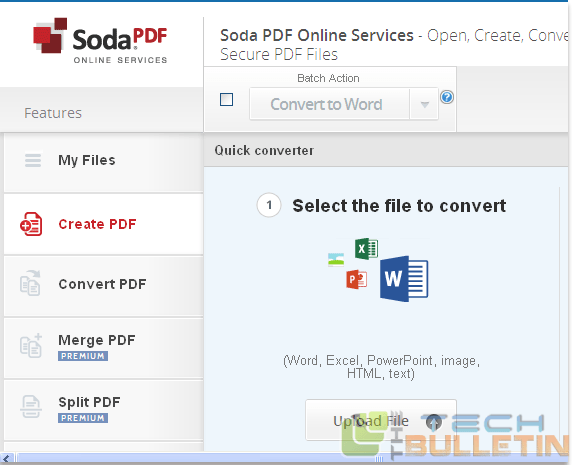 Fortunately, for the Firefox users, an add-on by name Soda PDF allows the users to convert the document files to PDF in Firefox browser, everything done in cloud. This makes the file conversion an easy task without installing any new software. After installing the Soda PDF add-on , you need to restart the Firefox browser and now you will find Soda PDF icon on the top right corner of Firefox browser. To start converting the files to PDF, you need to signup for an account, scroll down to bottom of the page and click on Sign Up button. Now enter your email and password and now you can convert the files into PDF. The three steps includes uploading the file, entering the email address and converting. You can convert the files of Word, Excel, HTML, Powerpoint and image files. Click on upload file button and select the file which you want to convert and wait to finish the uploading. In the next step, make sure that correct email is shown and if you want to send the notification to another email, you can change it here. Now click on Convert to PDF button. Now the original and the converted files will show the appear below the instructions as they are processed. To download the file that is converted, click on the disk icon present right to the file name. This will show the dialog box asks you whether to save or open the file. Converting the file into the PDF is a free feature, but there is also a premium plan is available and offers more options such as splitting and merging files. Registered accounts lets you for only 100 MB storage space and limits the file conversions to one file every 30 minutes.